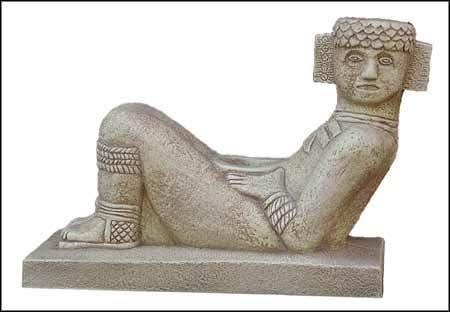 Chac-Mool, Chac Mool, Maya Art, Maya, precolumbian reproductions, mesoamerican reproductions, mayan art, arte maya. Temple of the Warriors, Chichen Itza, Mexico. 1000 A.D.
Chac Mools have been found across Mesoamerica, from El Salvador to Michoacan, although most of the best examples come from Chichen Itza and Tula. This Toltec style offertory figure is in its typical half-reclining position, supporting himself at the elbows, with its head turned to one side. The bowl held on the chests of Chac Mools were receptacles for offerings; in one Aztec example, the bowl held by the Chac Mool was a receptacle for the hearts of sacrificial victims. Chac Mools may symbolize fallen warriors who deliver offerings to the gods. The original of this Chac Mool is located in a wide platform in front of the entrance to the Temple of the Warriors in Chichen Itza; it is positioned between two large splendidly carved feathered serpent columns that symbolize the god Kukulcan. The term Chac Mool was coined by the 19th century explorer Augustus LePlongeon, and it literally means great jaguar paw in Yucatec Mayan.